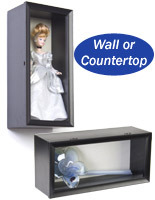 These Display Cabinet Shadowboxes Are Stylish Wall Mounting Curio Cases! These Cabinets Showcase Collectibles and Mementos With Ease! 1/2" deep 8-3/8" w x 19-3/8" h viewable area is ideal for creating dimensional exhibits. Black frame provides high contrast against neutral linen cloth backer covering. Economical glass front frame will complement any environment. These display cabinet shadowboxes have a 1/2" deep glass front enclosure with a foam backing board covered in neutral linen cloth. 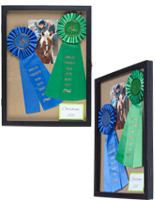 Each of these 8-3/8" x 19-3/8" display boxes have a contrasting black frame that will draw attention to contents. 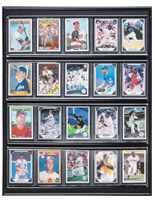 These eye catching showcases, wall mount display cabinet shadowboxes feature pre-attached mounting brackets on the back that will hang the displays in either portrait or landscape orientation. These black frames have clear glass fronts that allow perfect visibility of contents in any environment. 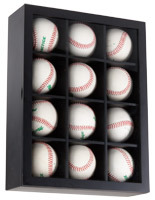 These attractive display cabinet shadowboxes, also known as memorabilia holders, include 8 pushpins that can be used to support photos, badges, medals, awards, mementos and more inside the cabinets. 9.7" x 21.1" x 1.4"